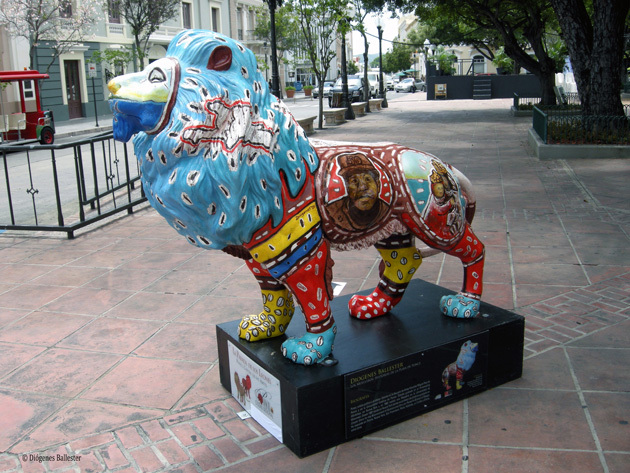 The public art Lion painted by Diógenes Ballester for the Municipality of Ponce’s Parade of the Lions 2012 is entitled The Dock Workers: Oral Histories from La Playa de Ponce. By history, Ponce has been Puerto Rico’s gateway to the Caribbean with the port and community of La Playa in particular connecting the Island with the greater and lesser Antilles and the South and Central American nations which line the southern and western coasts of the sea. Ballester has imbued this lion sculpture with eight pictorial stories from La Playa: 1) The Portugués River meets the Caribbean Sea, 2) Puerto Rico and the Antilles, 3) Ponce and La Playa, 4) The Old Pier, 5) Port of the Americas, 6) The Dock Workers, 7) Virgin of Carmen, and 8) The vejigantes. Each of these stories reflects a transcaribbean and ultimately transnational consciousness that speaks of how peoples and cultures merge and intersect. The stories are gleaned from oral histories some openly shared others told in clandestine grouping. Each story sits on top of multiple other stories of the rich history of Ponce. The first story depicted by Ballester uses the face and mouth of the lion as a metaphor for the mouth of the Portugués River. A fish forms the lions mouth, he has snail-shaped eyes, and a sun blessed disposition. Ponce was endowed with fresh river waters and a deep bay. One can only imagine the excitement of those early explorers and settlers when they sailed into what we know as La Playa de Ponce (named for Ponce de Leon) fed by the fresh waters of the Portugués River. Fresh water needed to sustain life. Fresh water sacred to all seafarers. Fresh waters merging with the salty waters of the sea, a magic place for commerce, interchanging, and living. One can also imagine how the pirates who first populated Ponce used the overgrown mangles at the river basin to hide themselves and their loot. One can equally imagine the syncretized religious ceremonies conducted in El Barrio San Thomas along the banks of the estuary, bodies swaying to the rhythms of the bomba and plena. Ballester and his boyhood playmates explored the river basin for treasures brought down stream from the mountains and in with tides. The Portugués River was canalized in the 1970’s but the riverbed remains, as does the lighthouse of Cardona. Ballester turns the majestic mane of the lion into the Caribbean Sea. He depicts the greater Antilles Archipelago with Puerto Rico centered on the back of the lion’s main and with Española, Cuba, and Jamaica disordered from their geographical configurations on either side. This representation is suggestive of the agricultural, cultural, and human commerce between the Islands, with Ponce an integral component. Although the transcaribbean interchanges and accompanying consciousness has been limited over the past 100 years, there is no denying the commonality of the experiences and ideas of the countries and people of the Caribbean which coexist as a common entity. In Ballester’s painting on the lion, this interconnectedness is represented by the shells that radiate between the Islands. Poncenians and Playeros may wonder about the division that demarks them. Ballester did and a bit of research quelled some of his quest for knowing. Although Ponce and La Playa de Ponce exist as a unified city, La Playa is not just another barrio. La Playa has been recognized as a distinct area since at least June 8, 1880 as evidenced on a map made in Madrid, Spain on that date. A painting of that map is located on the spine of the lion’s back. The Camino Real, now named Hostos Avenue, connects the two. On the right front side of the lion, Ballester painted an image of the Pier of La Playa built in 1804. The franchise for the Pier was decreed to the Municipality of Ponce by Spain in 1797 and by the United States of America in 1911. The franchise has been proudly maintained by the City of Ponce every since. At times, this required the unified struggle of the city government and the dock workers. Today, the Ponce dock is the only one on the Island that does not belong to the central Government of Puerto Rico. At the beginning of the 20th century, Ponce was a cosmopolitan city with a sophisticated transportation system. This can be seen by trolley depicted in Ballester’s painting. The trolley conveyed passengers from Ponce Central weaving through the city stopping at the elegant French Hotel, than making its way down Camino Real past the sugar cane plantations stopping at the warehouses and then the Pier. There were Spanish style mansions in La Playa back then inhabited by the barrens of commerce living close to their warehouses. They left La Playa after the slaughterhouse was built moving to Ponce Centro and el Vigia. Also depicted in the painting by Ballester are images of tuna fish. For many years, the community of La Playa was involved with the tuna-canning factory, National Packing. Vessels arriving from Japan were downloaded by the dock workers. The hulls of the ships were refrigerated to temperatures below zero. Ballester’s father, one of the dock workers, brought home stories from the sailors as the dock workers and sailors shared Island to Island. The tuna factory was closed and like much of Ponce and Puerto Rico as a whole there was an economic decline in the later part of the 20th century. Less and less boats arrived, but there was a promise of a Super port and shipyards, not yet realized. Although the story of the old pier ends with decline, a new story still struggles to be created. On the right hip of the lion, Ballester has painted a detail of the crane from the Port of the Americas, projected to be constructed in La Playa de Ponce. As with the other stories this one has a transnational connection. The crane, purchased for some twenty-two million dollars, came from China via Africa. A concrete manifestation of the Super port and shipyards that have been promised for over forty years to La Playa and Ponce to develop and revitalize its economic base, the giant crane can be seen from all of La Playa. Like the cranes in the busy harbors of Hong Kong, the Port of the America’s crane has the ability to lift full containers from the international ships that could once again connect La Playa and Ponce with the broader world through the Caribbean Sea and beyond. Although the construction of the Port of the Americas is stalled due to lost funding from the Puerto Rican Government and the crane stands idol, the determination of the people of Ponce is evident as little by little pieces of work continues. While Ballester fears that the Super port would undermine the peacefulness of La Playa, he appreciates the need for responsible development and venues for employment that are needed by the people of his community and all of Ponce. The future stands at a crossroads. Thus far, the stories have spoken of geographical, political, and economic structures, but without the human element, these are of little regard. The dock worker, which is depicted on the left front side of the lion, is made in the image of Ballester’s father, number 27, who loaded and unloaded ships for fifty years. Ballester’s father was known as a kind man. If one of his fellow teamsters was not feeling well and could not carry his weight, Ballester’s father would do his and some of the other worker’s load, always with a smile. He knew a few words of Japanese, some French, a bit of English from his interchanges on the docks. Although he never left Puerto Rico, he had an international perspective and knew what it meant to be interconnected. He and the other workers on the docks, in the factories, from the countryside, made Ponce the provisional Capital of the South of Puerto Rico. They and their families were the fabric of the community – a community, which needs jobs for their children and their children’s children so that they can sustain themselves and re-develop community with vitality and creativity. With people come their beliefs. The Virgin of Carmen represented on the left hip of the lion is indicative of the rituals through which the community of La Playa sustained itself and created meaning. The Virgin of Carmen, patron of La Playa de Ponce is celebrated on July 16th. By the end of the 19th century the inhabitants of La Playa established the tradition of making a procession with the statue of the Virgen of Carmen, which began at the Church of the Virgen of Carmen, passed through the village, and ended at the port where she was placed on an ancón, a flat bottomed boat. The processioners joined her on the boat and with trumpets and drums playing, threw flower petals into the bay. The sea portion of the procession consisted of presenting the patron to the aqua green waters and asking for protection for the fishermen and dock workers. This was just one of many ceremonies, Catholic, Espiritista, African, celebrated in La Playa as a way for the people to come together, make sense of their work and struggles, and honor their beliefs. The four legs of the lion are painted to represent the vejigas used in the vejigante carnival by the participants to hit people along the parade route. Ponce is famous for its vejigante carnival and costumes. Based on the 12th century celebration of St. James’ victory over the Moors but syncretized with African and Taíno traditions and representative of resistance, the vejigante carnival is celebrated in Ponce, usually during the month of February. Women from the community make beautiful customs designed and sewn from bright colored cloth. The mask maker use paper mache to create the multi-horned vejigante masks that are painted to depict monsters. When the slaughterhouse was still in La Playa, dried horns were used as molds. Senior Alindato, a dock worker who lived in the neighborhood of Puerto Viejo, was a famous mask maker who was commissioned by the Institute of Puerto Rican Culture to create a thousand vegiante masks. His house still stands near what used to be the neighborhoods of Curva del Muelle, Haiti, Santo Domingo, Las Cucarachas, from which the people and their houses were displaced in the 1970’s for the what was already earmarked to become the Super port. Ballester and his brothers along with other children in La Playa used the bladder of cows and pigs also from the slaughterhouse to make the vejigas which were painted them with multiple colors and simple designs. The carnival in La Playa was organized by the various neighborhoods with vejigantes parading through their own neighborhood before congregating in neighborhood of Salistral. As vejigantes from each neighborhood joined the parade, the energy intensified. The main route of the Carnival then proceed along the Colón street to the neighborhood La Boca along the Portugés River, which was also displaced in the 1970’s for what was to have been shipyards. The Carnival lasted throughout the day until the masks where lifted signaling the end of the festival. The Vejigante Carnival like La Playa has changed but it continues. Ballester, born and raised in La Playa, has been privileged to have transnational artistic experiences and the opportunity to present the richness of the Puerto Rican culture in Asia, Europe and other parts of the Caribbean. His work addresses the impact of the homogeneous expansion of the global economy that manifests in the multipolar union that defines different regions of the world as coexisting entities. The Caribbean is one of the regions, which Ballester sees as a transcaribbean consciousness, at times only grasped as similarities become evident. Another ongoing aspect of Ballester’s work is the use of oral history often clandestine, passed from generation to generation, suggested in documents in historical archives but not written. These oral history stories occupy a space between what was and mythology and are accessed only through discussions and interviews which reveal memories embedded in the fabric of communities. In his lion painting, Ballester once again re-contextualizes symbols from our past and oral histories that speak to those aspects of Ponce that are tied to the sea, the port, and the people of La Playa. He visualized the sculpture of the lion as a center of energy with each part related to transcaribbean consciousness, clandestine oral history and his life experiences in La Playa de Ponce. He offers it with love to the city of Ponce.